For our congregation, Christmas Eve services have eclipsed Easter as our highest attended services, so the pressure seems increasing high to make those services great. If you are married, you get the joy of balancing family Christmas celebrations with your parents and your in-laws. Add a new baby to the mix and the demands and expectations of the family begin to soar. Here are a four tips to help you not only survive the holiday season but thrive. Look at the calendar early. For our team, 2015 is especially difficult because of where Christmas Eve falls. So, we will have regular weekend services (Saturday & Sunday) have one day, and then we begin Christmas Eve services Tuesday, Wednesday, & Thursday. Christmas Day is off; then we have Saturday & Sunday Services again. That kind of schedule can WRECK your holiday plans if you don’t plan ahead. For 2015, we have 76 Services planned between December 19th and December 27th. Set proper expectations with yourself. One of the “costs” of serving the Lord in a church is “missing out” on mainstream family traditions. Long ago, I had to put to death the images of Christmas Eve family gatherings with hot cider and caroling with all my family. Part of my sacrificial and joyful gifts to Jesus is my Currier & Ives picture of holiday celebration. The guiding biblical precept is 2 Corinthians 9:7. Paul explains that “God loves a cheerful giver.” By the way, don’t leave the price tag on this gift to the Lord by complaining or lamenting your sacrifice. Set proper expectations with your family. The truth is, you have an opportunity to cast vision for your whole family. THEY have an opportunity to share in the ministry to the church by their willingness to give up something for the sake of people being able to hear about Jesus. For many years, our family served together on Christmas Eve. Our daughter served in the Children’s ministry providing crowd control, my wife and son served in media with me. My mother-in-law provided a meal after services and a quiet place to decompress after services. Our out-of-state parents travelled to us when they could and often delayed celebrations well into January. Our whole family served the Lord with a willingness to be flexible. Honor the Sabbath and keep it holy. This command of the Lord still applies in December. In fact, more than ever, December demands frequent re-calibration of motives and priorities. 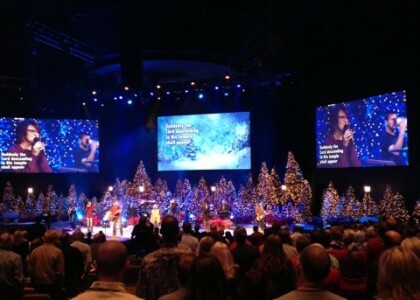 What would it matter if you created the most amazing Christmas Eve worship environment for your church, and yet you missed out on worshipping Jesus yourself? Our team sets our calendars, deadlines, and expectations based on a schedule that required a day off before Christmas Eve service beginning. This schedule prevents us from going into the services “breathless” or exhausted.